Looking for the perfect Xmas present for the young ones in your family? Here are five products (targeted at children of different ages) that the kids in your life are sure to love. Suitable for children over 8 years, this remote control car drives on the floor, races up walls and even zooms across ceilings. The car charges via the controller and has its own LED lights. The car requires 6 x AA batteries for the controller (these are not included in the box) and is a very cool car to race. An excellent present for someone who loves car and racing! You can order this online at www.findmeagift.co.uk Do check out their website as they have a large range of toys, games, gadgets, accessories, personalised gifts and even sweets in store. Spearmark Housewares is a leading designer and distributor of children's lunch ware, tableware and drink ware products. 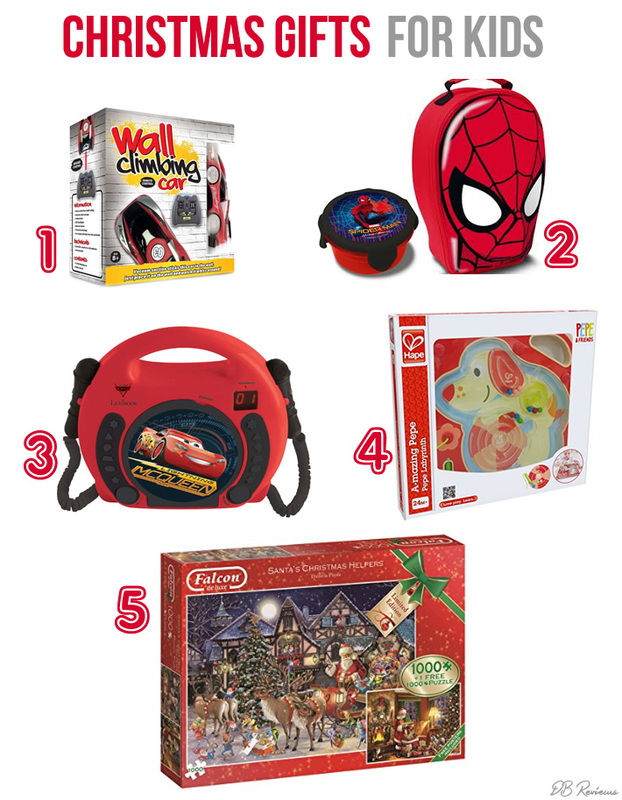 In addition to bespoke products they also have an impressive licensed range of products featuring popular characters like Angry Birds, Hello Kitty, Spider-Man, Peppa Pig, Transformers and a horde of other Marvel characters. If you know someone who loves Marvel superheroes, then you are sure to find a lovely gift for them on Spearmark's website. My nephew is crazy about Spider-Man and these two products from Spearmark are perfect for him. The Spider-Man Snack Pot is ideal for storing snacks and treats. It comes with four secure clips that are easy to use for all ages. The Spider-Man lunch bag is equally stylish and would make a lovely gift. You can check out Spearmark's product range at www.spearmark.co.uk Spearmark products are available from Sainsbury’s stores, Toys R Us & Dunelm stores. Know a music lover or a Disney fan? Then this Cars CD-player (with two microphones) would be the perfect gift for them. Suitable for ages 4 years and over, the CD player features a carry handle and headphone jack so that they can listen to the music anywhere and the two microphones included mean that they can sing along with their favourite singers. The CD player has an LED display and also a repeat function. It is easily portable, good build quality and would make the ideal gift for a budding pop star! Hours of singing and fun are guaranteed with the Disney Cars Sing-Along CD-Player. With a bright and colourful design, this maze toy is sure to capture any toddler's attention. Suitable for ages 24 months and upwards, this makes for a lovely travel toy. With a solid wood construction and child-safe paint finish, the toy helps develop problem-solving skills and stimulates general development. Available to buy from Amazon.co.uk. Who doesn't love a classic jigsaw puzzle? This limited Edition Falcon de luxe 2 x 1,000 piece jigsaw puzzle, illustrated by the artist Daniela Pirola, tells the story of Santa and the Elves preparing and delivering presents on Christmas Eve. Produced using a high-quality cardboard and measuring 68 x 49cm when finished, these puzzles are really fun (and a little challenging) and sure to bring a lot of enjoyment while trying to complete them. You might be interested in the other gift guides I have published on the blog - Gifts for women and Stocking Filler ideas.